I always loved crepe paper. As a kid I enjoyed doing all kinds of crafts with this magical paper, I made my Halloween mask, 3D pictures, garlands and much more. I remember how my mother would make a paper flower on occasion and how I admired it. Naturally I wasn't skilled enough as a kid to make a flower on my own as tissue paper can be a bit delicate. Luckily when I grew up my love for this craft remained and my skills improved. Spring is very a busy time of the year with my family as it seems most of our friends and family have birthdays in April and May. As they all deserve something unique they will each be getting a bouquet of these (roses, calla lilies, carnations,...) and a handmade card. But these are great to make all year round and they do make a perfect gift or decoration for any occasion - I was thinking the other day they would also make a one of a kind wedding bouquet and there would be no fear of flowers wilting (not sure if they would survive the bouquet throw though). I want to share some of the flower tutorials with you so you too will be able to enjoy the art of flower making as much as I do. Be sure to check back in the future as I will be adding more tutorials when I will be making more flowers. Photos on this page are taken by me unless stated otherwise. Red roses. Who does not love them, they are a symbol of beauty. The first of the birthday girls is my aunt and as she really, really likes red roses she will be getting a small bouquet of them. I could also add decorative sand and a vase to the list as there really isn't a better way to showcase your flowers than to put them in a vase full of decorative sand. Make a heart shaped stencil similar to the one in the picture. My petals were around 3 inches (7cm) high and 2 inches wide (5cm). You can chose any size you want as roses come in many sizes. When you decide on the size, cut a long strip of crepe paper (if we take my measurements let it be around 3 inches wide and 20 inches (or more) long. Fold it (accordion fold/zig zag fold - each of the folds as big as the petal). I folded the paper 10 to 14 times (to add some diversity in sizes from rose to rose) and I used two strips for one rose. Use paper clips to secure the stencil on your accordion folded paper. 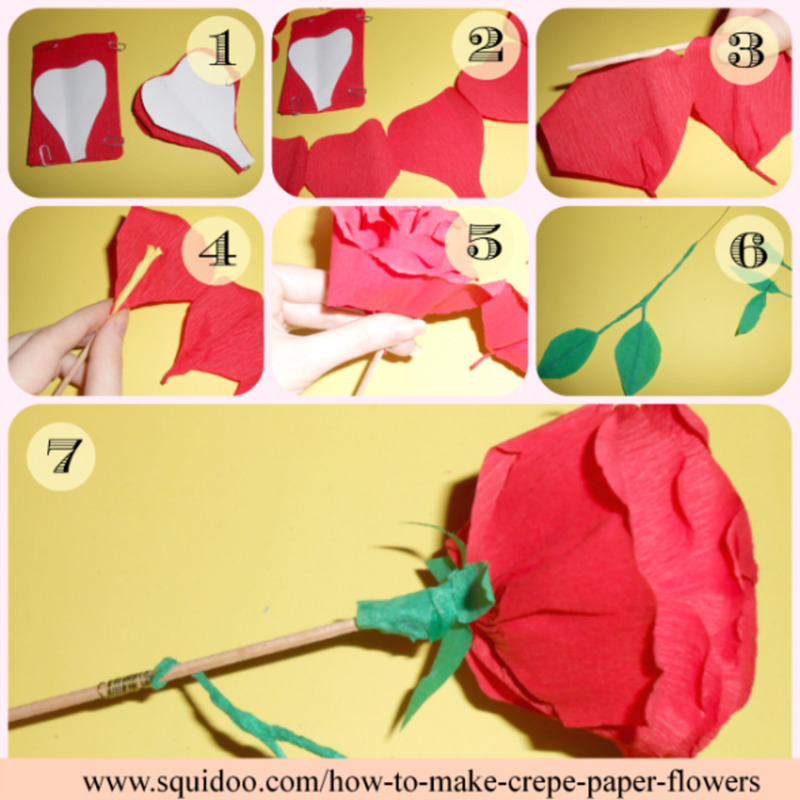 Cut out the shape but be careful not to cut on the edges - so that your petals will be joined together in one long strip (as seen in picture number 2). 3. Curl the flower petals and roll the bottom parts of petalsUse the skewer you will later use as the stem to curl the upper part of the petal. Roll the bottom part of the petal between your thumb and index finger - this will give the shape to the petal. 4. & 5. Wrap the petals around the stickI used some of the yellow tissue paper and glued it at the end of the stick but this is optional as it won't be seen in the end. I used white glue to secure the first petal on the stick and after it dried I just rolled the rest around, slowly positioning each of the petals to get the desired shape. I secured them with some florist wire and glue. I did the same with the second strip of petals. You might need to try this a few times before you get the shape right. 6. Make leaves and sepalsCut 4 small sepals, roll one side of them between the fingers as you did with the flower petals. With florist wire make a twig and wrap it with green paper. Cut out some leave shapes and glue them on the wire.6. Add the leaves, sepals and finish the stemCarefully glue the sepals on your rose. Wrap the wire with leaves around the wooden stem. 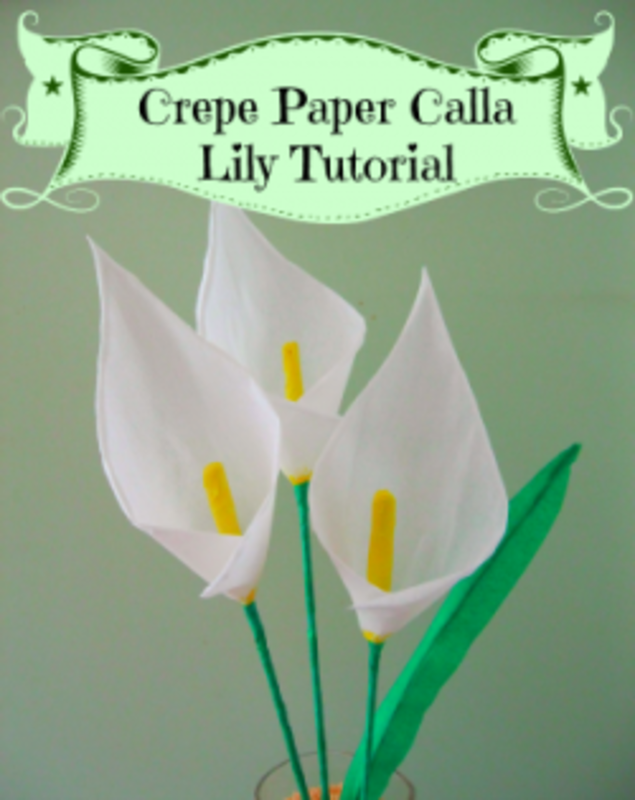 Wrap the stem with green crepe paper with glue. All done. 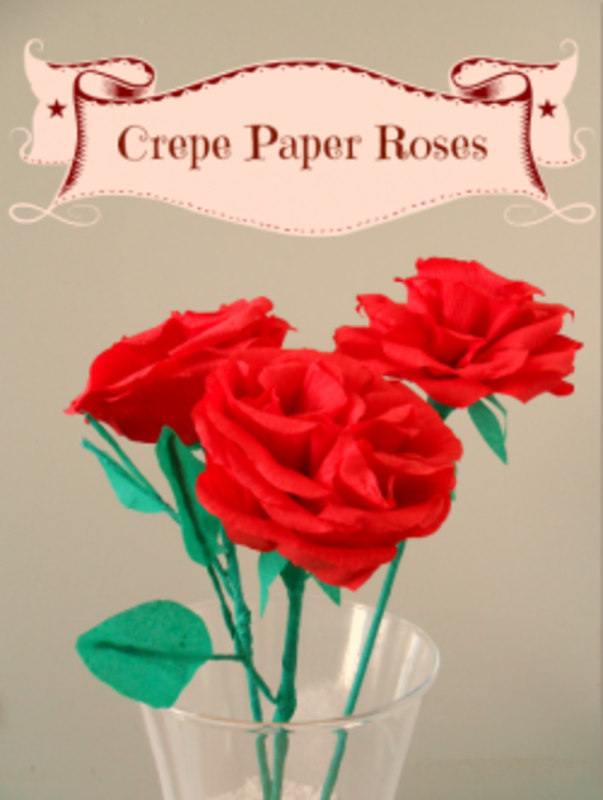 These are a must if you will be making lots of crepe or tissue paper flowers. Extra long skewers. These work great for making stems of certain flowers. I like my skewers as long as possible since you can always make them shorter. These will also come in handy with various other craft projects. All the colors of the rainbow (and more). It's best to have more colors. There's nothing I hate more than to get a crafting inspiration and not having the materials (in this case colors) to get the job done. This wire is thin enough to use for securing the petal onto the stem. Calla Lilies are one of my favourite flowers. And they are quite easy to make. My mother in law will be getting a bouquet of these! I love the woman! Whenever I discuss mother in laws with my friends and they tell me all the horrible issues they are having with theirs and how many subtle critiques they get I just can't believe how lucky I am. This woman rocks! 1. Make a stencil and cut out the petalDraw a stencil on a paper and cut it out. Each calla lily needs only one petal. The dimensions I used were around 5.5 inch (14cm) wide and 6.5 (16 cm) in height. I do love crafting books! While I do think I am crafty on my own these books are great for broadening your crafty horizons and learning new techniques. One thing that always brings a smile on my face in these books is when you find a technique so simple to use you can't believe you haven't thought about it before. Paper to Petal is a crafting book that I eagerly anticipate as there really aren't that many crepe paper craft books out there to get your inspirations from. This book promises to reveal all the basic techniques you need to create stunning artwork as well as trick and tips on how to create unique masterpieces. I expect to find quite a few interesting flowers in this one, and I hope to see flowers that can't be found where I live as that will indeed give me the opportunity to learn something new. 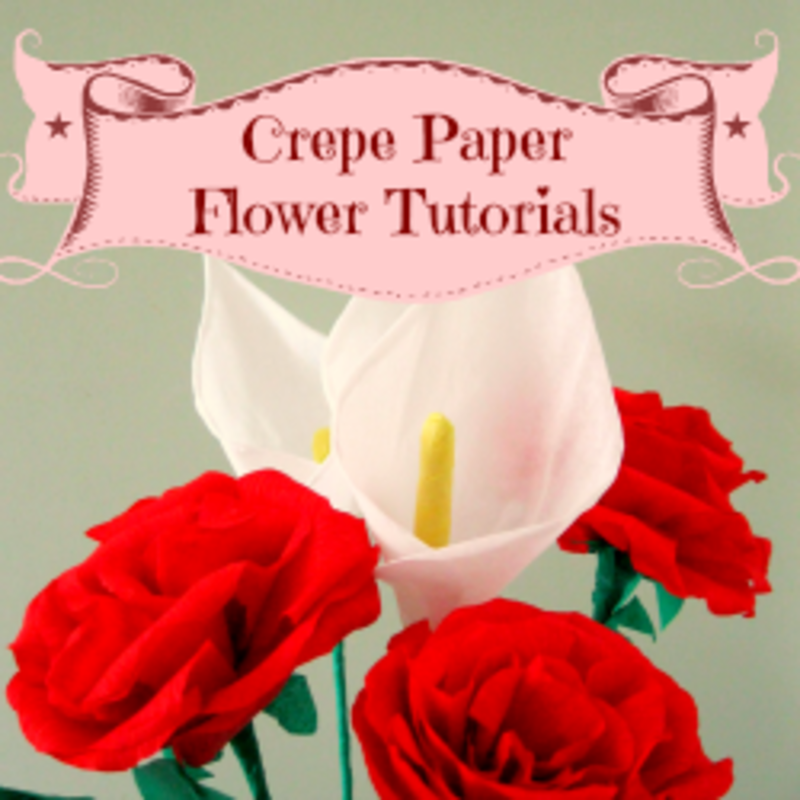 Best way to learn how to make crepe flowers is to study the real ones. Don't you just love it when flowers start blooming? 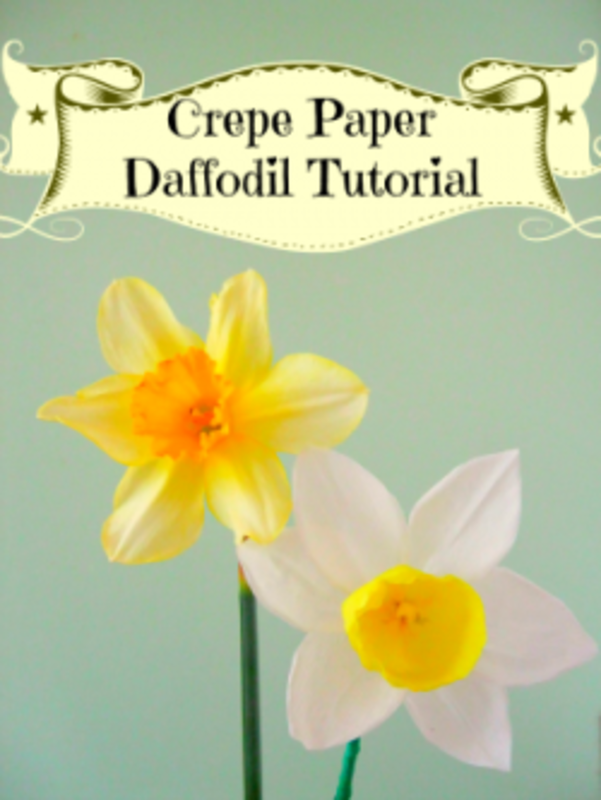 Daffodils are the first that have bloomed this year in our garden and I decided to make one out of crepe paper to show you how you can use the actual flower for a template, I mean what better stencil to use than an actual petal? 5. Place the cup onto the stemTake the stem and place the cup onto so the stigma will be in the middle of the cup. Secure the bottom part of the cup with wire. You can also add some glue. 6. Make 6 petalsI used an actual leave as a stencil, I just added some length to it so I could glue the petals onto the stem. They came at around 2 inch long (5 cm) and 1.25 inch wide (3 cm) not counting the added length (which was around 0.5 inch - 1 cm). You will be needing 6 petals. I think it's best if you make them in different sizes and slightly different shapes as this will make the daffodil look more natural. 7. Give the shape to the petalsRoll the edges of the petals between your thumb and index finger a bit to make the edges more natural. 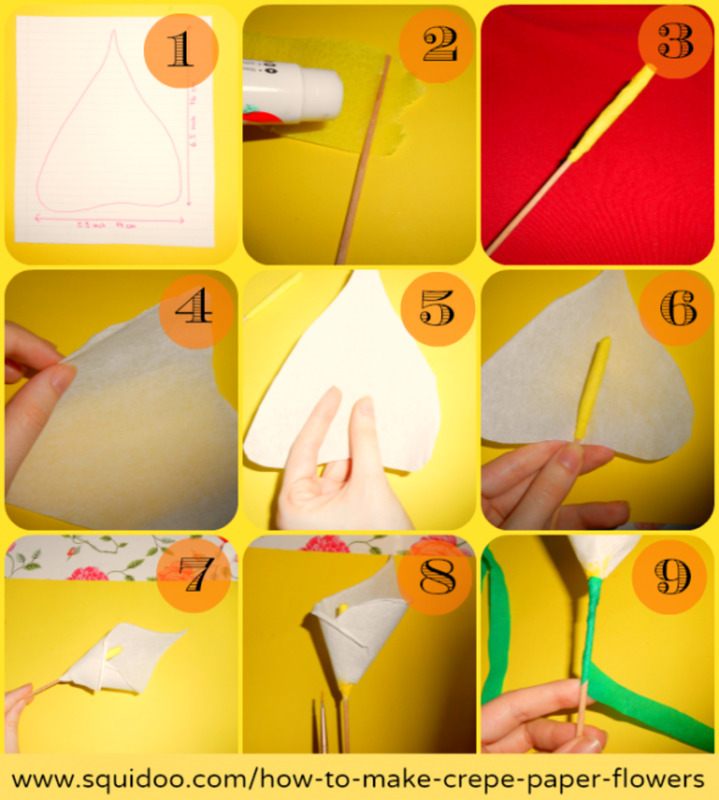 Most daffodil petals have one or a few folds on them so be sure to make them. Also streech the crepe paper a bit to give it some texture.8: & 9. Stick the leaves to the stemNow this is the tricky part and you will need some patience. Apply some glue on one petal and place it under the cup. The petal will have a mind of its own believe me but with some patience you will have it standing the way you want it. Be sure to give it enough time to dry before you glue on the second (and other) petal. Work your way through to the 6th petal.Last but not least - the stemTake a strip of green paper and wrap it around the skewer, starting under the cup and working your way down the stem. Make sure you don't have any mischievous pets in your working area. This little monster snatched my daffodil cup and ran away with it. 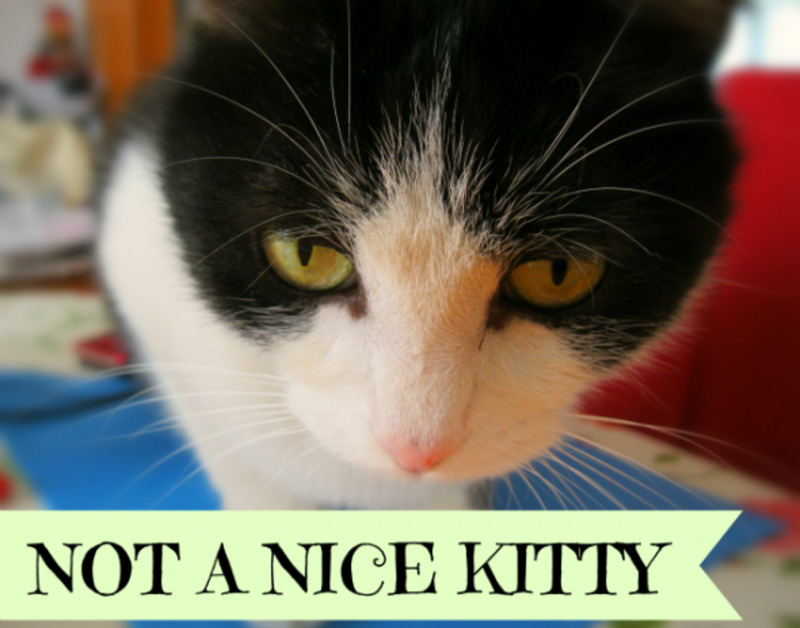 Not a nice kitty at all! But we still love him and sometimes he does prove to be a helpful crafter. Can't you just smell them? Say hello! - Liked the tutorials? Want to see more of them (which ones)? Revisiting this delightful crafty, flower making lens. Love the photos of your crafty crepe paper "garden". 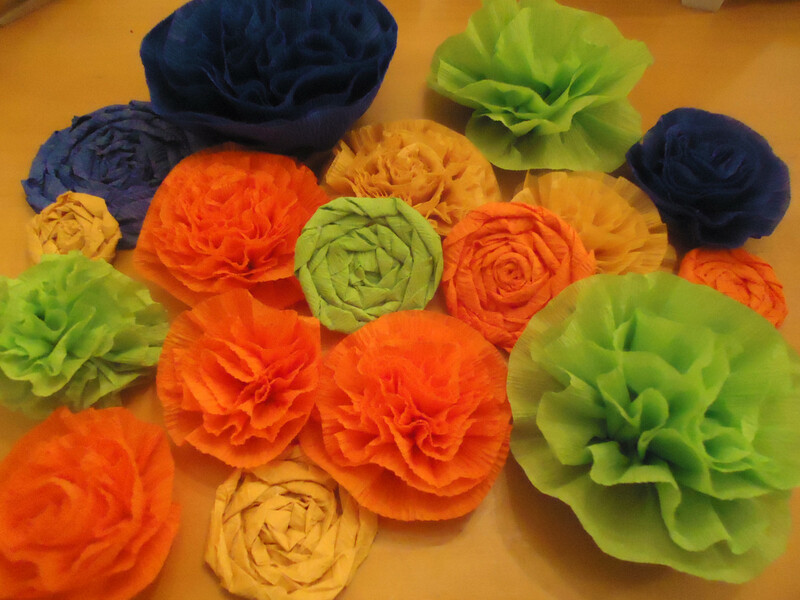 I used to make crepe paper flowers as a child. But nothing like this. This is art! Great lens and congratulations on winning the Quest, clearly you deserve it! I can hardly believe those flowers were made with crepe paper...the realism you've captured in each flower is awesome! Congratulations on LOTD! Really nice lens, I love it! Very creative and detailed instruction. Well done. I like Crepe Paper Rose. What lovely flowers you made, and they are so easy to re-create with your detailed step-by-step instructions! Congrats on LoTD. Great instructions! I'm normally not that great at crafts, but I may have to try these out. Thanks for sharing :) And congrats on LOTD! I really love this lens! thanks for sharing this awesome content. I loved crepe paper is a kid. I didn't know it was still being made. It used to be easy to find everywhere. I am so glad you wrote this so now I know it still exists. 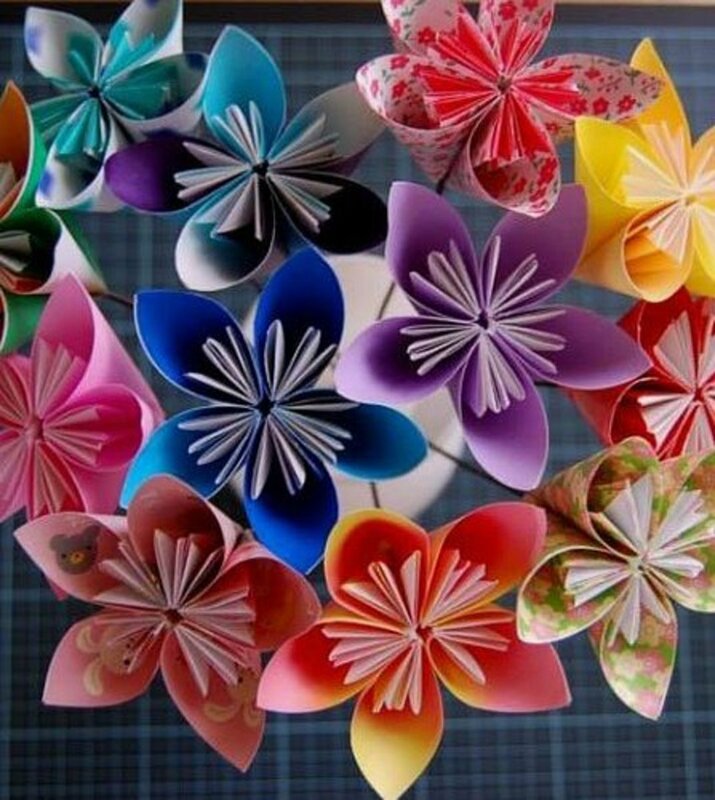 Amazing paper flowers. Looks like fun. My kitty would run away with one, I'm sure. This was a very interesting tutorial lens, malina123, with well documented instructions and pictures!! Lovely flowers and helpful photo tutorials. I've made daffodils from regular paper but I think I like the texture the crepe paper would add to the flower. My mother made crepe paper roses and carnations and I learned to make them from her. Thanks for the instructions for the calla lily and the daffodil. I'll have to try them. This is so beautiful. The pictures are so sweet. I'll use this craft in my art lesson. Very well done malina123. Your lens is really easy to understand with the step-by-step instructions and followed up with the easy to see photos. 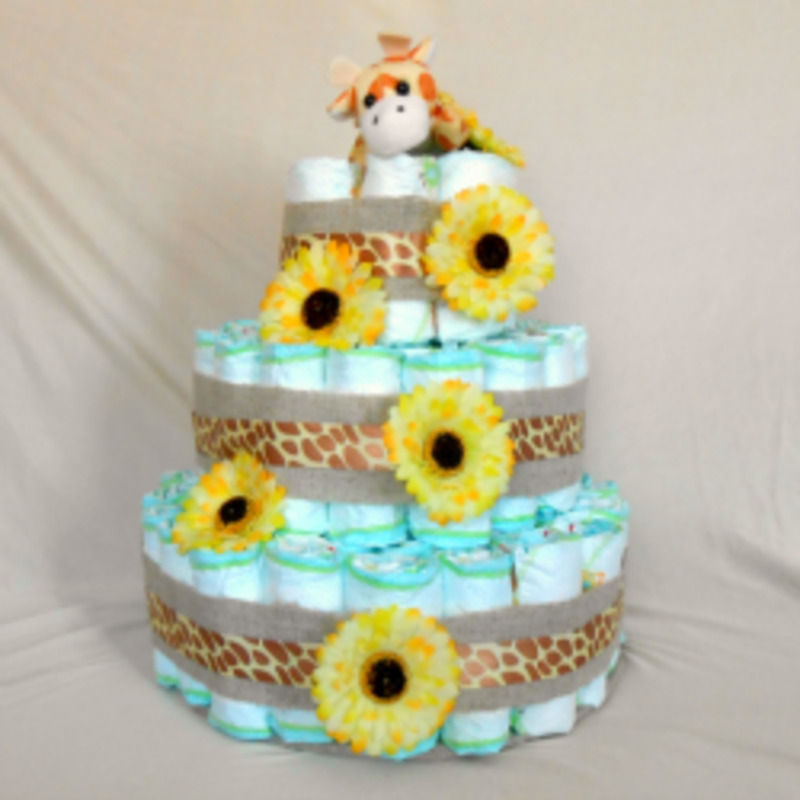 Congratulations for being this month's Craft Quest winner and everything else. Have a Great Day! Congratulations on your LoTD and purple Star. This I will have to try. Thanks for sharing. 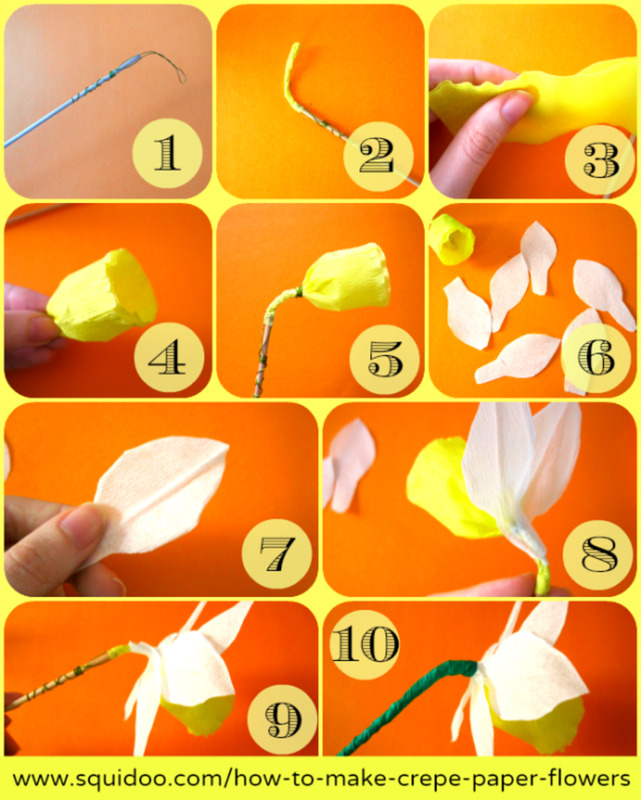 This craft for making flowers is one that I will try with my grandchildren! They love it when I teach them how to make stuff. Congrats for LoTD and Purple Star, very well deserved for such an exceptional lens. Lovely roses, look almost real. Kudos to you for being the winner of the Crafty Challenge, LOTD, and Purple Star. Wow. You have put in great effort to making this lens. Great job. Do check out my lens too. I love these flowers and the way you made the photos to illustrate the tutorials. Congratulations on winning the Crafty challenge, Purple Star, and Lens of the Day. Well deserved. What a wonderful lens! Thank you for your careful instructions and the pictures of your beautiful crepe paper flowers and congratulations on winning lens of the day! Wow, what a great idea for a Lens! Thanks for this info and Grats on Lens of the Day! Congratulations on your lens of the day! Thanks for taking the time to make a great lens. Make it a creative day! 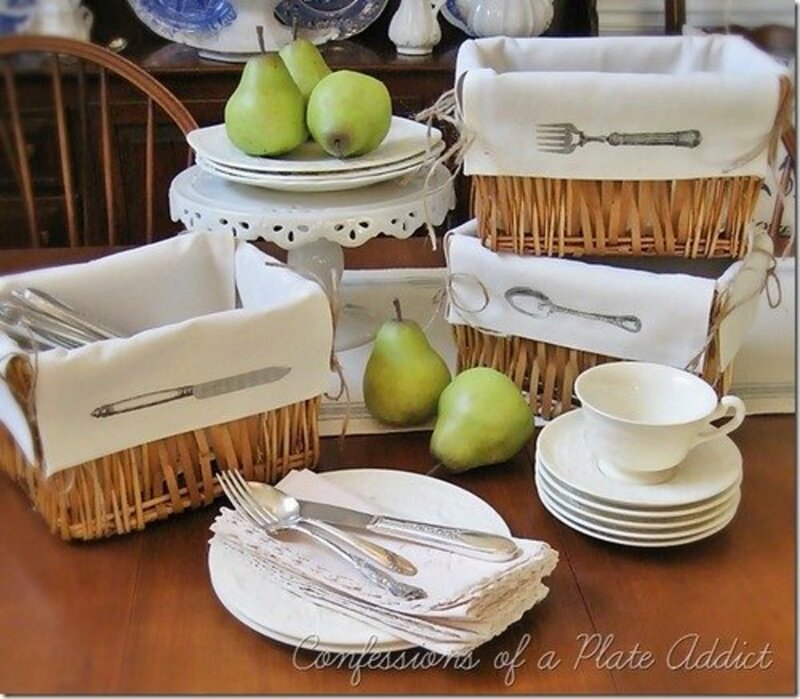 any they are well cool and make cute table décor!!!!!!!!!!! I love your beautiful paper flowers. Your lens brought back childhood memories. Congratulations on LOTD and Purple star. I come from a time when people made these items out of necessity, because "store-bought" items were not available. Your lens brought home to me the times we would sit around the dining room table with my mother, crafting all sorts of beautiful items. Thanks for sharing. These flowers all look fantastic. Thanks for the great step-by-step guides. Congrats on LOTD. This is really neat! They would be fun to make. I love that they are forever lasting. The only issue is with that "crafty" kitty. If they are anything like ours there is no way to completely remove them. I know I have tried. Also congrats on the LOTD! These are great! I haven't worked with crepe paper in years, but I know I could follow your instructions. Love the kitty! :) Congratulations on your So Crafty win and the Lens of the Day! I'll definitely give the calla lily one a try. Great lens - pinned to my crafts board. Naughty kitty. I've got one who specialises in tearing up paper. I think your flowers might drive her over the top. Love the calla lilies. I had to laugh at the cat photo. Cats love to rearrange quits blocks laid out on the floor too. Congratulations on the LotD and winning the SoCrafty quest!! thank you for lovely tips.. Perfect presentation of creativity! Congrats! Great tutorial. The pictures really make it feasible for me to make them. 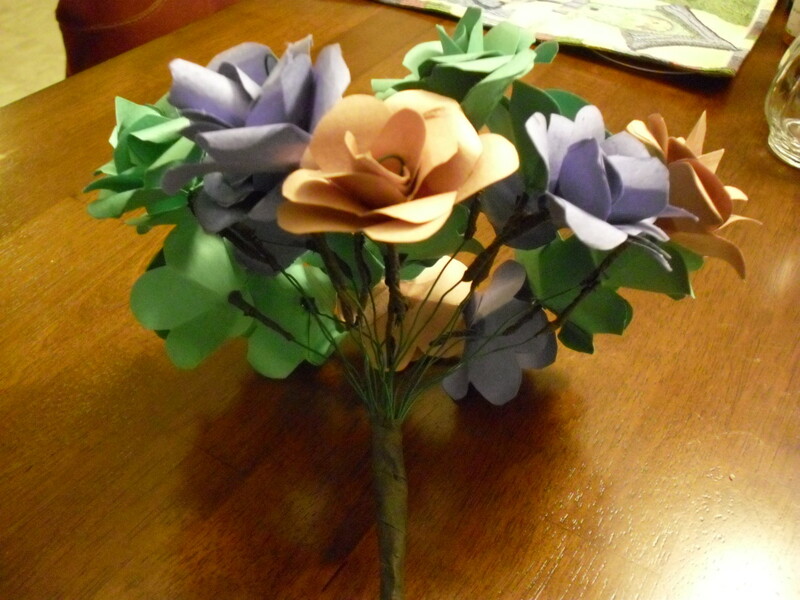 I love the crepe paper roses. 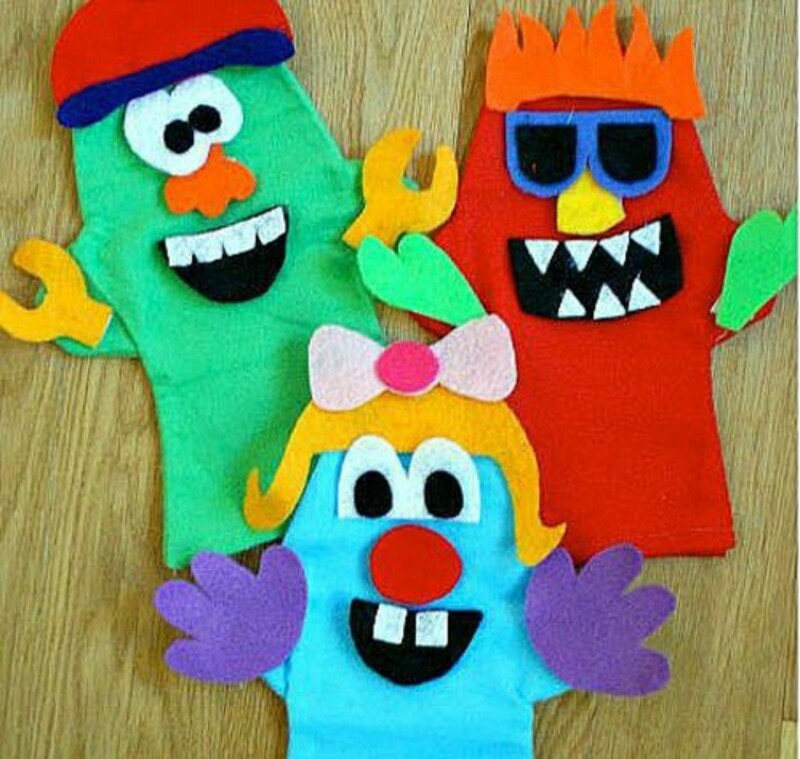 I haven't used crepe paper since I was a child and I would love to try making some of these. Very nice photos easy to understand instructions, I make peonies but never attempted the others, I will give it a try soon. Great Job! 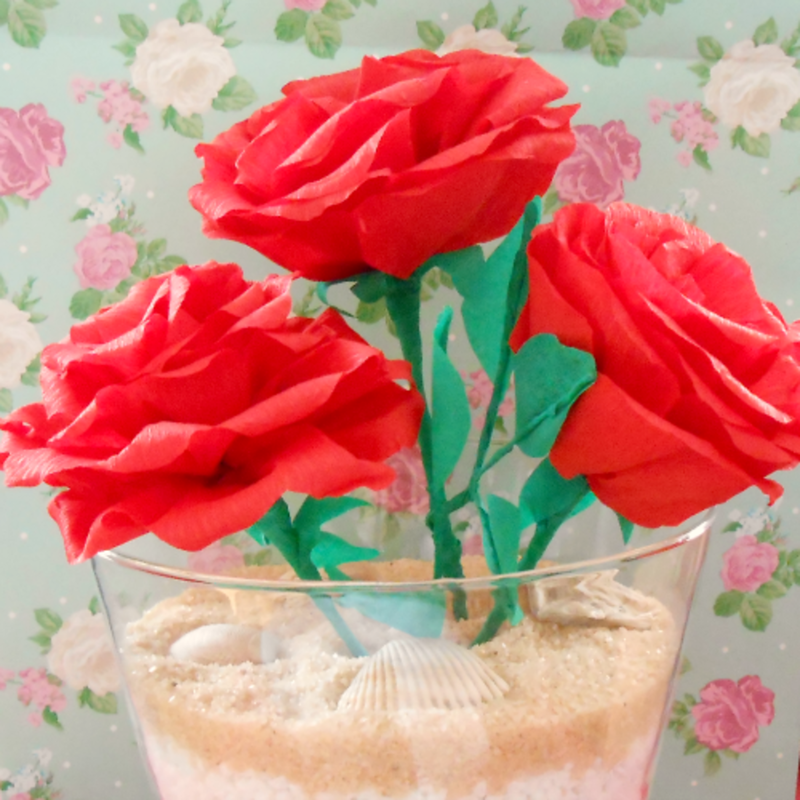 I really like these Crepe Paper Roses, because the color red is so vibrant. Wonderful lens - your tutorials are nice and complete - some paper flowers tutes are woefully lacking in details. The first time I saw crepe paper flowers was when I lived in San Antonio. They have an entire parade that pays homage to them - The Battle of Flowers. It's like the Tournament of Roses parade in Pasadena except that most of the flowers are handmade. These are wonderful tutorials! Thanks so much for sharing. great lens.. I give it 5 stars! Esp. love the last tip!! Though the cats I've had, current one included always seemed to like to 'help' they usually just sit and watch. Sully ( https://hubpages.com/animals/sullycat ) however sometimes likes to come &amp; laydown on what I'm writing, reading or working on lol. These are so beautiful, thank you for sharing! I am going to try to make some for mother's day!